Simon Nzigu was a fortunate child. Simon’s father, an accountant and the only educated man in his rural village, insisted that his son receive the best education possible. But when Simon was 17 everything changed. His father died of AIDS. Simon’s father had pleaded for Simon to continue his education after his death. But without a male head of the household, Simon’s family no longer had the means to provide schooling. The year that followed his father’s death was a dark time for Simon; he was without hope. With no money for school, his education was over. He lived in the village for an entire year, believing that subsistence farming was his only choice in life. Simon wanted more for himself. Fortunately, so did his village. Simon had always been a bright kid and the villagers had seen his potential. They knew that without an education he would never have an opportunity to realize that potential, and so the community came together to ensure he got one. Family, friends and neighbors funded Simon’s education, for in him they saw hope. When Simon qualified for the top technology university, they saw to it that he was able to attend. Throughout Simon’s education, not a day went by that he didn’t feel blessed. 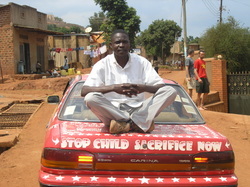 After that year spent in the village, he understood the value of education. Without it, he had been hopeless. At university, Simon studied information technology and took a two month volunteer position with a NGO in northern Uganda. Originally he had accepted the position because it provided a small stipend. But when he left, he took more than the money. He took with him an idea, to start a charitable organization in his own village. For while he had been lucky, there were hundreds of children who weren’t so lucky. When Simon was on a university break, he returned to the village to talk to his Aunt, herself an AIDS widow. She lived in her late husband’s house, technically Simon’s house, as its tradition for property to pass to the oldest male of the next generation. The home that Simon inherited was quite large by village standards, and most of his aunt’s children were grown and gone. So Simon asked his aunt a favor: would she open her home to orphans? Simon’s aunt was happy to do so, and within months, Simon’s inherited house was home to nine parent-less children. A good start. But Simon wanted more. He began mobilizing a team of volunteers across the district to find supportive homes for orphans. In 2008 Simon’s idea came to official fruition; Hope For Orphans and Rural Development became an officially registered an NGO by Kamuli district and the Bugulumbya sub-county where the organization is headquartered. In December 2008 he became the second person from his village to graduate from university. Just as the community came together to support Simon’s education, they have now come together to support HORD, ensuring that Simon can dedicate all of his time to growing the organization and its impact on the community. Simon has returned to his village, and the home he shares with orphans.